A Classic Bass with Tons of Tone The Squier Affinity Series Precision Bass PJ allows you to add the best Fender-designed quality to your playing. Rock robust tone thanks to the combination of Precision and Jazz bass pickups each with their own volume knob and a master tone knob, allowing you to dial in your preferred sound. With a maple neck and 20-fret rosewood fingerboard, this Precision Bass PJ bass is designed for fast, comfortable playing, so that you can hit every note. 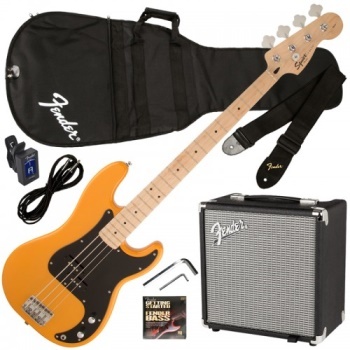 If you want the quality of Fender at an affordable price, pick up a Squier Affinity Series Precision Bass PJ! Neck designed for fast, comfortable playing Made from solid maple, with a rosewood fingerboard, the neck on Squier's Affinity Series Precision Bass PJ is designed to deliver a powerful, robust tone. The 20 medium jumbo frets provide you with added playing comfort, so you can continue for hours without hand fatigue. A fast-playing neck is vital when you're holding down the bass line, and Squier understands that. The Affinity Series Precision Bass features a neck and fretboard that ensure you'll never want to put it down. Precision Bass and Jazz Bass pickup combo offers versatile tone Giving you the best of both Fender Bass worlds, the Affinity PJ gives you versatility of tone. The split-coil P Bass pickup gives you aggressive, meaty tone while the J Bass single coil delivers crisp, full-bodied sound for a bass that is balanced, versatile, and classic Fender no matter which pickup you have turned up. Bassists love having a bass as versatile as this in their instrument arsenal. Fender quality at a great Squier value Squier Affinity Series electric guitars and basses provide you with renowned Fender quality at an affordable price. The Affinity Series features some of the most time-honored models, including the Stratocaster, the Telecaster, the Jazz Bass, and the Precision Bass. These versatile guitars and basses are offered at the very best Squier value to make Fender quality more available to everyone. If you've been looking for a great guitar or bass to complement your playing, Squier Affinity Series electric guitars and basses have an instrument for you. Squier Affinity Series Precision Bass PJ Guitar Features: Fender quality at a great Squier value Standard split-coil Precision Bass pickup and single-coil Jazz Bass pickup give you versatile sound Volume control for each pickup and a master tone control let you dial in your own tone Fast playing maple neck with 20 medium jumbo frets and rosewood fingerboard Top-load bridge for classic Fender playability and tone Capture Fender quality at a great Squier value, with Squier's Affinity Series Precision Bass!